Friday, July 27th marked the beginning of the end of our trip as we set off to meet our last partner, Uganda Community Farm (UCF), in Kamuli. Kamuli is a town in the Eastern Region of Uganda, about 45 miles north of Jinja. We arrived at UCF a little after 1PM where we were met by our host Anthony. Anthony introduced us to his team - Rena, who is responsible for accounts and community outreach with farmers UCF partners with, and Viola, who is responsible for the farm equipment. Before setting out to explore the grounds of UCF and look at their current projects, Anthony gave us a little bit of background. UCF began in 2016 when Anthony organized approximately 230 local farmers to band together to grow ginger. The thinking was that if they could pool their product they would be able to sell it in bulk to a larger buyer. Unfortunately, after training the farmers in growing ginger and providing them with enough ginger rhizomes for planting, the price of ginger collapsed. This pushed the farmers back to the local market where they could get a slightly higher price. Despite the initial setback, Anthony’s enthusiasm was undiminished and he continued to think of ways he could help those who didn’t have much. Anthony’s current idea had us excited and was the primary reason for our visit. Anthony had begun the installation of solar dryers on his property. By installing solar dryers he could access fruit grown by local farmers and dry the fruit and add value in the process. Additionally, it would help farmers with the fact that much of their crop ends up rotting on the ground or on the tree because they can’t eat it all and the market is flooded with fruit when in season. It is a fantastic idea, and we can attest to the need for it, after seeing so many overripe mangoes rotting on the ground in Bujagali. Without an adequate way to save or preserve food, lots of fruit goes to waste when it is in season here. Harvesting this otherwise wasted fruit into a product would certainly benefit the rural communities in Uganda, both by preserving food for the next season and creating a product to sell. Anthony is just getting started with the solar dryers, which look a lot like slightly modified greenhouses. He hopes to dry mango, pineapple, papaya, ginger, and other crops. While UCF’s solar drying operation is just getting started, it was exciting to hear their innovative ideas and see them beginning to take shape. Anthony is dreaming big and looking for ways to take advantage of inefficiencies in the local community. Ultimately, that is what this is all about: looking for a need and then trying to fill it. That brings us to the end of our travels. Eight Rockflower partners. There are numerous numbers we could attach to our trip. However, nothing could do justice to the people we met, the places we saw, and the generosity we received, and the amazing human spirit we found all around us. There are amazing people all around the world with incredible ideas and energy focused on improving the lives of women and girls and by extension the world. Rockflower is but a catalyst to help get these ideas off the ground and connect these people to create a network of changemakers. We truly feel privileged to have been able to travel on behalf of Rockflower, meet the partners who are making our mission a reality, and at the most simple level be inspired by the compassion and humanity we witnessed every day. We had now been on the ground in Uganda for 10 days. We spent nearly a week with SOUL Foundation and Mama Ali’s family in Bujagali and completed three Rockflower partner visits in Kasese. In that time we had learned about and experienced the joys and challenges of life in rural Uganda. We had seen the impact a grain mill can have on a community, how education transforms the lives of young people here and how vocational skills empower and enable women to support themselves and their families. We were nervous and excited about our work for today: to host a listening session with over 50 potential Rockflower partners from the greater Kasese region. Our hope was to bring together leaders from these organizations not only to meet with us but to share ideas, experience and knowledge with each other. For this Sunday gathering, we arranged a catered meeting in the White House Gardens in downtown Kasese. We asked Biira Mary, from the Rwenzori United Group for Life Improvement (RUGLI), to help us with translation throughout the day. While the majority of the Ugandans we met could speak and understand English, more often they speak in their local, native languages. We have a tendency to speak quickly and that, combined with our American accents, could be difficult to understand. Mary did an exceptional job translating throughout the day and it is in large part thanks to her that this meeting was successful. With over 60 people attending the meeting, we were able to break out in groups focused on each of Rockflower’s Five Keys: Peace & Security, Maternal & Reproductive Health, Access to Food & Water, Education, and Economic Empowerment. The spectrum of ideas these groups are working on is as impressive as it is diverse. As we moved between the different groups we heard enthusiastic, cheerful conversations taking place. The Maternal & Reproductive Health groups discussed ideas that included emergency motorcycle (boda boda) transport for women in labor, increasing access to reusable sanitary pads for adolescent girls, eliminating obstetric fistula and reducing maternal and infant mortality rates in rural Uganda. The Economic Empowerment and Access to Food & Water groups discussed a broad spectrum of projects, including: installing wells in communities to increase access to water in drought-stricken Kasese; brainstorming projects to train women in growing vegetables, sunflower, cassava, and other crops; they talked about how to raise livestock. They talked about the importance of protecting pollinators such as black bees, and the benefits of bio-briquette production. The ideas and projects these groups are proposing and taking on are important, critical work to empower their families, communities, and regions. Further discussions focused on making reusable bags from banana fibers, arranging for group savings and loan schemes for young women and girls, and sustainable tree nurseries to combat deforestation and create economic opportunities for women. The depth and breadth of these projects were impressive and inspiring. The listening session was an opportunity to bring groups and individuals together to discuss the challenges they face and how they might collaborate to bring their work to fruition. For example, there were multiple groups in attendance making reusable sanitary pads for women and girls. This critical work enables girls to continue their education more seamlessly and effectively. To make the pads, however, requires training in how to do sew them and access to the right materials, which are quite costly. Our hope is that these groups could connect, share information, and potentially work together to increase the scale of their production and reduce the cost of materials. Service projects, such as making sanitary pads, are challenging because there is rarely an easy way to generate income from this work. Combining service projects with other efforts, such as gardening or baking, could perhaps bring in revenue to more easily purchase the materials required to make the pads. After the first formal breakout session, we paused the conversation for lunch. The White House Gardens Hotel put on an impressive spread of chicken, matooke (mashed starchy bananas, like plantains), Irish potatoes which grow well in this region, rice, avocado and fruit. The meal was delicious and everyone seemed to enjoy the opportunity to talk more casually with new acquaintances and old friends about the work they are doing. Most of our attendees were women and were likely taking time away from their families and cooking responsibilities to be with us. The opportunity for us to provide them with a meal, that they could sit and enjoy while sharing ideas with other like-minded people, meant a great deal to us and likely also to them. After lunch, we continued the idea-sharing and information exchange work in smaller groups and then came back together for a larger sharing session. While there was no way to hear about each individual project in the larger group setting, it was a great opportunity to hear some highlights from each group. As the conversations continued, there were increasingly comments such as “I’m doing that too, and I’d like to talk with you more about it.” While many of these people live in close proximity to one another, they do not necessarily know or regularly communicate with each other. It is an example of how, by forming connections between like-minded groups, Rockflower can serve as a conduit between these individuals and thereby build a network of knowledge, skills, and experiences to improve communities not just locally but also on a larger, more global scale. The meeting was a tremendous success. We are grateful to Biira Juliet from Hope for Rural Women for her help in organizing the day and to Biira Mary from RUGLI for serving as our translator. The White House Gardens staff were also critical in accommodating many more people than we anticipated and making sure they all received a delicious meal. It was a great day of forming new connections, building friendships, and identifying potential partners while sharing ideas and experiences in how to better the lives of women, their families and their communities in the greater Kasese region. 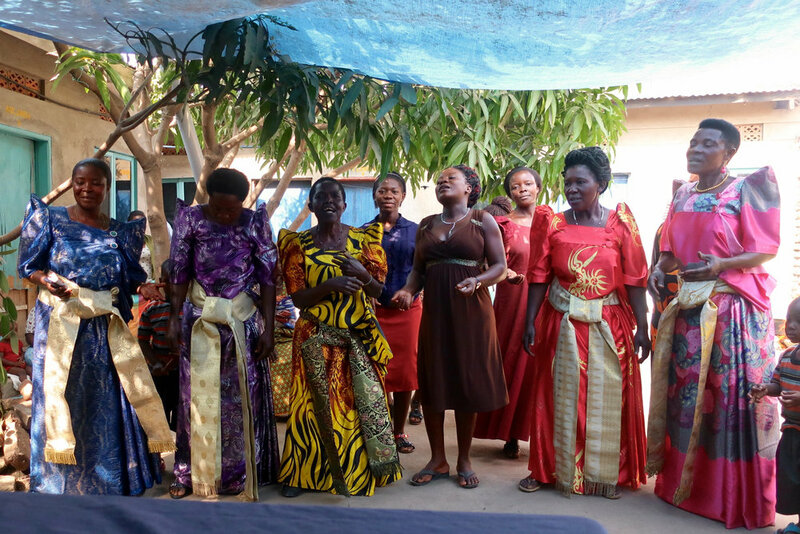 In the early afternoon of July 21st, following our visit with Hope For Rural Women (HORUWO), we made our way to the headquarters office for the Rwenzori United Group for Life Improvement (RUGLI) in downtown Kasese. We met Biira Mary, the leader of RUGLI, and a few other members at their office where they introduced themselves and gave us an introduction to their organization. RUGLI originally started as a group savings scheme in which women would pool together savings and then make low-interest loans to members of the group. This pool of capital allowed Mary to organize the women into a bio-briquette cooperative, a business that not only empowers women in the Kasese community but is also a sustainable business model for an environmentally-sound product. RUGLI employs women making bio-briquettes as an alternative cooking fuel to charcoal and wood. With our awareness of climate change and the need for our generation and future generations to be better stewards of the earth, we were immediately struck by the potential of this eco-conscious business. Our excitement was strengthened by our growing awareness of the impact of drought on the region. Though only our second day in Kasese we were well acquainted with the consequences of drought: there was no running water at the hotel, the roads were dry and dusty, and the crops we had seen were failing. Kasese is located at the base of the Rwenzori Mountains on the border between Uganda and the Democratic Republic of the Congo. Climate change is wreaking havoc on this region of the world, which has a long history of chaos and instability. The bio-briquettes made by RUGLI are a creative and innovative approach to combating climate change, creating economic opportunities for women and ensuring access to food and water. Mary makes a compelling case for an alternative to charcoal and wood, the primary fuel sources for most Ugandans. Both charcoal and firewood are drivers of deforestation in the region, which contribute to climate change by reducing the capacity of forests to take up carbon dioxide from the atmosphere and altering regional ecosystems. In addition to the environmental impacts, for those who cook with firewood and charcoal, there are associated health concerns. Typically cooking and meal preparation is the work of women and girls in a home, who spend hours toiling over charcoal and wood fires cooking dishes like posho (a thick corn porridge), potatoes and rice. The smoke produced by the cooking fires is an irritant to their respiratory systems and vision. This is one of many stressors to the lives of women and girls in rural Uganda. Creating an environmentally-sound alternative fuel source that generates less smoke, such as the briquettes, has the potential to fundamentally change the health of communities and the local environment for the better. RUGLI produces three types of briquettes from materials that are typically considered waste. The briquettes produce less smoke (in some cases none), last longer and burn hotter than other fuel sources. After an introduction to their work and the need for it, we visited the facility where they make the different briquettes and met the larger RUGLI team. During our visit, they were making a briquette from the charcoal dust, cassava flour, and water. They gather dust left at the bottom of charcoal sacks from their neighbors or from the shops of charcoal vendors; the dust is otherwise thrown out as waste. The charcoal dust, cassava flour and water are mixed into a paste and then patted into briquettes by hand or pounded into a simple machine with 24 briquette molds that Rockflower funded RUGLI to acquire. Once in the machine, the briquettes are forcibly compacted, then pushed out of the molds and transferred to storage to dry. RUGLI also produces two other types of briquettes, one made from sawdust and paper and the other from bio-waste, such banana leaves and corn cobs, which are often abundant and otherwise discarded. While we did not see the production of either of these briquettes, the sawdust briquettes were being used to fuel one of the cook fires. Though our visit took place on a Saturday, one would never know this was not a typical workday. Dozens of women and girls were there to greet us, all hard at work making briquettes. Some were making the initial charcoal and cassava flour paste, others were pounding the paste into molds, and still others transferred the newly formed briquettes to the drying racks. Currently, RUGLI is limited by the amount of equipment (one briquette mold-machine and one machine to grind components) and by storage space for briquettes to dry. As they continue to grow, they hope to purchase more equipment and secure a larger storage and drying facility. It was terrific to see so many people actively and enthusiastically engaged in their work. They were covered in sweat and charcoal dust but that did not dampen the pride and ownership RUGLI members take in their work. RUGLI members also sell the briquettes and share savings as a cooperative. In addition to making the product, members effectively run an advertising campaign by sharing their product with friends and family, creating a market for the briquettes in the area. To buy a large sack of charcoal costs a family 50,000 UGX (~$15) whereas an equivalent amount of briquettes costs 35,000 UGX (~$10) and, because of the efficiency with which the briquettes burn, it will last longer than a sack of charcoal. Though a difference of $5 may not sound like much, for those who live on less than $1 per day, it is significant. During our visit to the RUGLI facility, Mary and her staff briefed us on their progress to date. Their savings scheme and community-based marketing work are serving them well. They are currently having trouble making briquettes from wasted plant-based material because of the grazing laws in the Kasese region. Livestock is not allowed to roam and graze, so families use banana leaves and other food waste to feed livestock, making it more difficult for RUGLI to acquire these materials. RUGLI is a growing organization with hopes of expanding their production. Additionally, they are training others in how to make this environmentally-sound alternative fuel source in their communities. We were particularly impressed by the poise and professionalism Mary brings to her team and by the community she has created in this work. We were so impressed, in fact, that we asked Mary to help us facilitate our upcoming meeting with potential Rockflower partners in the region. After an efficient and informative two hours with RUGLI, we said goodbye to Mary and the larger RUGLI membership. We were energized and invigorated by their work, and our heads were spinning with opportunities for this project to be replicated in other communities and/or with other Rockflower partners. RUGLI represents much of what Rockflower aims to do: create global peace prosperity through investment in women and girls. On Saturday, July 21, 2018, we woke up in Kasese. Kasese is located in the southwest corner of Uganda, nestled between the Rwenzori Mountains and Queen Elizabeth National Park. The day before, we had left Bujagali Falls at 5AM with our driver, Michael, and Mama Ali’s youngest daughter, Muyombi Zahara. We had invited Zahara to join us after getting to know her during our stay with Mama Ali. She is 19 years old and a nursing student, with some free time before beginning her next semester. Due to her excitement about the projects and work that Rockflower invests in, we took the opportunity to expose her to more of the inspiring people and work happening in her country. We felt this was the least we could do, in return for all that Mama Ali’s family had done for us. We would soon learn, that our driver, Michael, would be much more than that for us. He taught us about the history and customs all throughout Uganda. 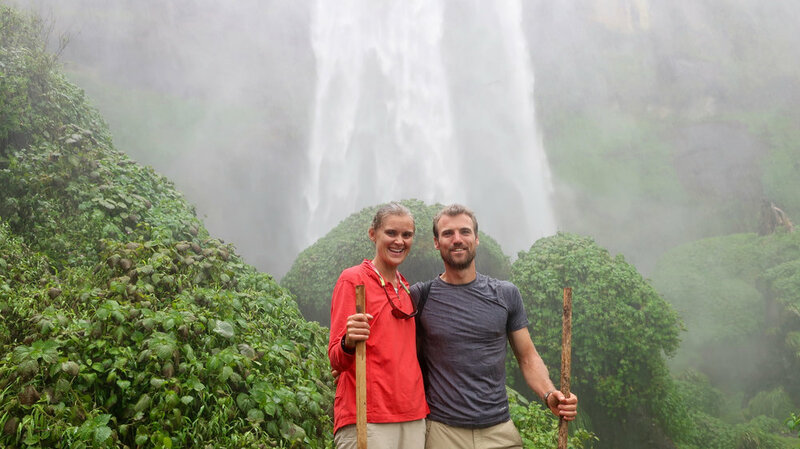 He was there to help us navigate different situations, to act as a translator when needed, and he brought a keen eye for detail, noticing many things that Emily and I would have missed. Our trip was enriched beyond belief because of the relationship we were able to develop with Michael. After a breakfast of eggs, toast, and fruit we were eager to begin our day. After all, this was why we were in Uganda: to meet with Rockflower partners and see the amazing and impactful work in which we are investing. The day was going to be a whirlwind with visits to three different partners. 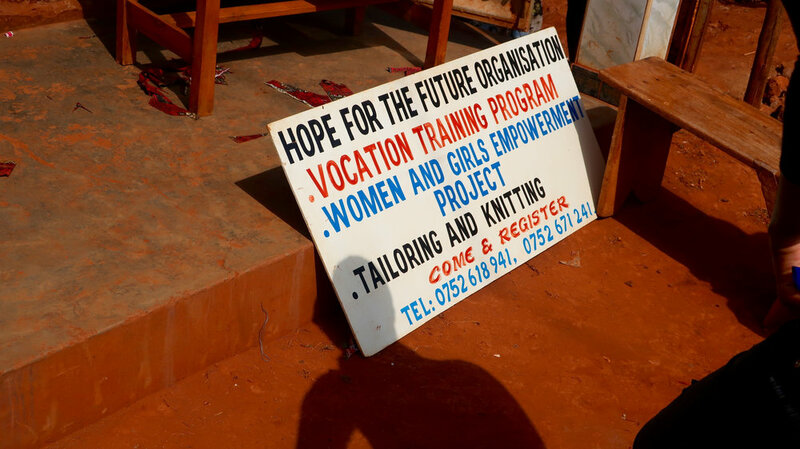 The first visit was with Hope for Rural Women (HORUWO), a community based, non-political, non-sectarian, non-profit-making organization. HORUWO is committed to the promotion of women’s and children’s rights, peace and justice, and ending domestic violence in rural communities, through education and health services. We met Biira Juliet, the chair of HORUWO, and a member of her staff, Jolly, at 9:30AM. Both women were dressed in Gomesi, the traditional women’s dress of the Buganda and Busoga tribes. Gomesi are bright-colored dresses made from a silk or satin-like material with big cheerful patterns. They have a big sash and distinctive shoulders. Juliet and Jolly guided us to a building that serves as HORUWO headquarters. There was a tall gate in front of the building which offered little suggestion of what was to greet us on the other side. As we stepped out of the van we were greeted by loud, joyous voices singing out over the enclosure. Suddenly the gate opened and dozens of members of HORUWO emerged from behind the gate, singing and dancing to welcome us to their home. After making our way inside the gate we sat at a table in front of the group and they began the program that they had prepared for us. We were welcomed with more singing and then a report of the work they are doing. Similar to S.O.U.L., HORUWO takes a holistic approach and supports women on a number of fronts - health, economic empowerment, and education, to name a few. The presentation demonstrated how important this community has become for its members. One of their youngest members - Diana - had recently been accepted into a nursing and midwifery program. The pride emanating from the group was what you would expect of parents for their child. We were learning on this trip that family extends well beyond blood lines and that there is a reason the Ugandan people are known for their generosity. Diana sang a touching song to the group, primarily women, about the strength and importance of mothers. In the midst of this song the group showered Diana with gifts of all types - notebooks, soap, corn flour to make posho, beans, a suitcase, and other necessities - so that she could begin school with all of the supplies she would need and more. Diana appeared a little overwhelmed by the generosity of this group, which was nothing compared to what we were soon to feel. Soon after Diana’s moment, the members of HORUWO processed up to the table and showered us with gifts. It was an incredible and overwhelming experience, knowing that they did not have much but were so eager to give something up to welcome us, complete strangers, to their home. Everything they gave us was beautifully wrapped in banana leaves, tied with banana fibers and decorated with pink bougainvillea. They were so pretty that it was a shame when they started opening them for us. We learned from Zahara that it is tradition to give visitors gifts, often from their garden. We had traveled to Kasese in the midst of a drought. We learned this when we arrived at the hotel where we were staying, to find that there was no running water. Because of the drought, the water table had dropped to the extent that water was particularly scarce, even for the dry season, and could not be pumped into the hotel. Knowing this and then being given food from these women’s gardens was an incredibly powerful and humbling moment. After more formalities, that included a few welcoming words from the elected official of the village, and some words from us about the work Rockflower does and why we were in Uganda, we were given a tour to see and really experience a small snapshot of the work that HORUWO is involved in. In their “office space,” where we met the group, they grow mushrooms and had planted a number of micro gardens. This space is more of a classroom than an office, as one of their projects is teaching women to grow food in less than ideal spaces. They have developed techniques using whatever is available - pots, empty tires and even plastic bags - to create spaces to grow vegetables. While this may have seemed very small scale, the impact of even such a small amount of independence is huge and empowering. One of the challenges that HORUWO faces iss working through circumstances that they cannot control. The current drought posed one such challenge, and the micro gardens mostly succumbed to it. After this introduction, we piled into the van with Michael and a number of members of HORUWO and set off to tour their other sites around Kasese. At the first site we visited HORUWO grows vanilla. Vanilla is a very lucrative commodity, so they rent a house with a cement wall to protect the compound and their crop. A vanilla seedling costs under a dollar, while a mature vanilla vine can produce 1-2 kg of vanilla beans, which sell for approximately $90/kg. The vines themselves can also be sold for a similar amount. Much of the farming in Uganda is of the subsistence variety, in which families grow food to live on and any extra is taken to market to earn some money to purchase other necessities. HORUWO’s vanilla project is a bold step to go further. Many of the projects HORUWO undertakes require some level of capital to sustain them. HORUWO is thinking about how to make their work sustainable in a way that could eliminate the need for outside funding. 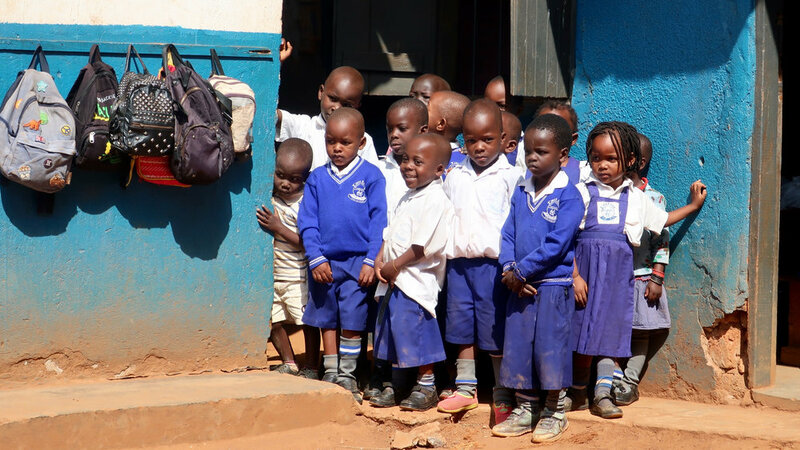 With the profits from this project, HORUWO hopes to buy the house they are currently renting, so they continue to expand this project to support the other work they are doing. We were impressed with how forward thinking the group is. We were beginning to realize that the entrepreneurial spirit in Uganda is incredible. Just as they are working to empower their membership and teach independence, HORUWO is aware that it is necessary for their organization to become self-sustaining. After the vanilla site, we headed a short way away to see their mushroom production. HORUWO uses a few rooms in the home of one of their members to grow mushrooms. The mushrooms are in bags hanging from the ceiling. Similar to the vanilla project, mushrooms offer an exciting opportunity as there can be a significant return on investment. Because of the drought and the hot dry conditions the mushrooms were dormant, but there was hope that as the season changes from dry to wet (usually in August) the project would take off. For us, this project highlighted how important it is for these groups to diversify the work that they do. It also shows just how powerful a collective group can be. As individuals, none of these women could afford to invest in multiple cash crops like this; not only do they not have the time, but they don’t have the space or resources. However, when they are able to pool their resources and share the workload, the opportunities are amplified. Our last stop was a third property that is owned by one of the HORUWO members. When we stepped out of the van, we saw rows upon rows of coffee seedlings. While Ugandans don’t drink much coffee, they are well aware of its popularity elsewhere and the potential revenue that can come from growing it. HORUWO probably has 20,000 coffee seedlings growing in little plastic bags which they will tend until they are more mature before selling them at a significant profit. It was exciting for us to see how resourceful these women are and the different projects they had. After a very busy morning with HORUWO, we were still feeling overwhelmed by all we had seen and experienced with them. We thanked Juliet, Jolly and the HORUWO members for their generosity, effort and time in hosting us and sharing their work with us. A longtime Rockflower partner, we would see the HORUWO leadership again at our meeting with 50+ community-based organizations and potential Rockflower partners in the Kasese region the next day. 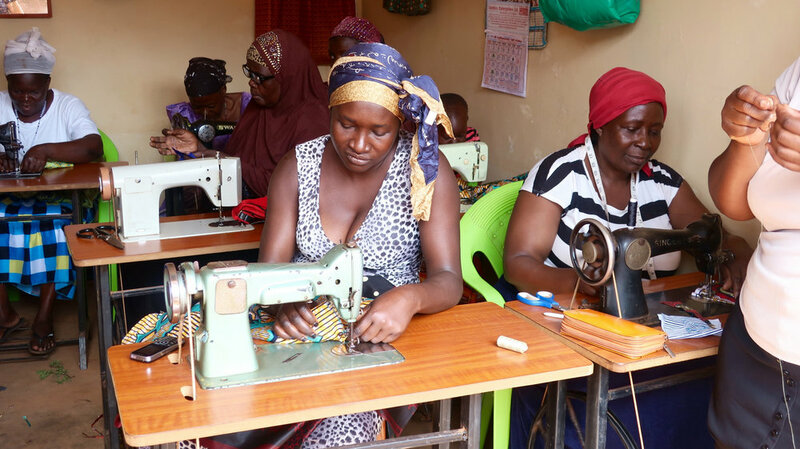 Seeing the work HORUWO is doing, and the potential for it to expand and become self-sustaining, added to our understanding of what is necessary for community organizations like these to empower women and communities through economic opportunities. In the Currency of Mind blog, we will discuss recent insights gleaned from the wider development and impact investing community as well as our projects and partnerships. Please check back frequently for new additions to the blog or subscribe to Rockflower updates on our homepage. What does It mean to have a Currency of Mind? The concept "Currency of Mind™ is based on the premise that the mind is the most valuable and powerful currency, i.e. means of exchange, that exists. Everything of value starts with an idea created in someone's mind. When you share an idea it increases, it expands and takes on energy – becomes currency. Whilst money is still the currency of choice (and store of value) for now, note that the ways we assign and transfer value are under review. In a very short time, the technology behind blockchain will revolutionize so many of the transactions in our lives and alter the ways many industries transfer worth, including philanthropy. However, Rockflower has chosen from the outset to place the Currency of Mind™ - ideas - at the forefront of what we consider valuable. Our intention has been to consistently find ways to unblock the flow of money to those whose ideas have the greatest potential for growth. A good example of Currency of Mind™ in action is the evolution of Rockflower's partnership with Women Advocacy Project (WAP), based in Harare, Zimbabwe. Constance Mugari, Executive Director, who, as you will see, is aptly named, contacted Rockflower back in May 2016 – at a time when our current commitments were already stretching our resources. However, a conversation took place that remained – well – “constant”. Even though from a practical standpoint there seemed little reason to continue conversing – we did just that - based on the mutual feeling that something valuable would come from it. Constance Mugari, Executive Director, speaking at Give Us Books, Not Husbands event. In November last year, Rockflower and Women Advocacy Project launched the first campaign – “Give Us Books Not Husbands”. 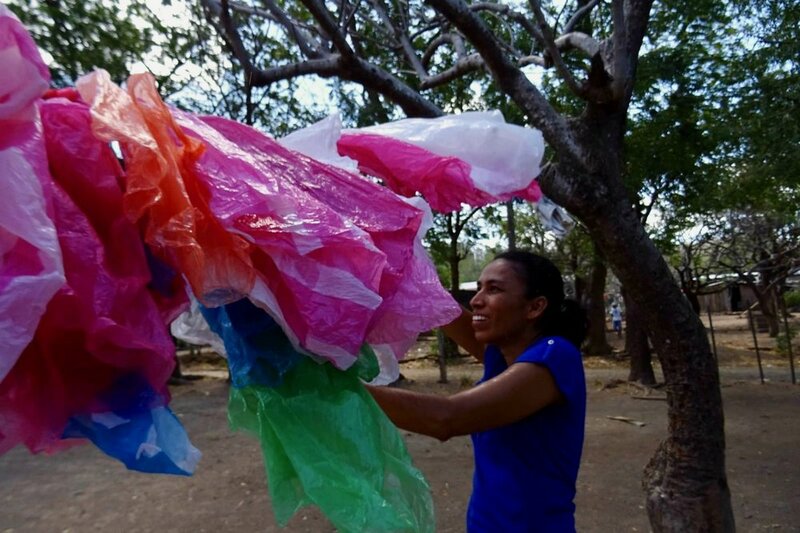 Although a small initiative, the power of the original idea and the commitment to seeing beyond what at first seemed possible, led to connections and initiatives that have benefited Women Advocacy Project and it's beneficiaries. The Give Us Books Not Husbands campaign increased visibility for WAP and led to valuable connections with other international organizations, greatly increasing WAP's potential new sources of funding. Constance's meticulous attention to detail and determination to follow through on endless applications and recommendations created constant forward momentum. This resulted in a new WAP website which was developed, pro bono, providing a valuable online presence, something Constance always knew was needed to expand their work. 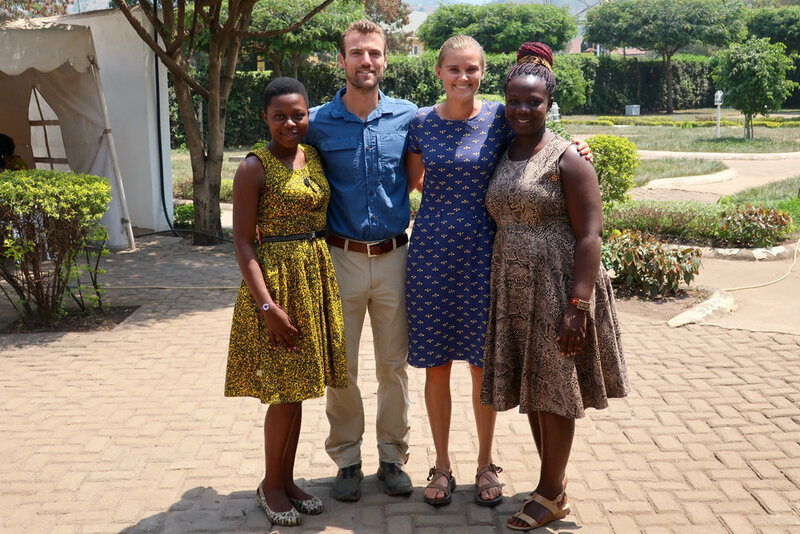 A little over a year after our first contact, Women Advocacy Project is on track to exponentially grow their organization as well as their reach to improve the lives of young girls and women in Harare, Zimbabwe. The power of the Currency of Mind™ lies in not being afraid that our ideas might be lost or come to nothing. Instead we look at what might be gained by simply sharing them.